KA: Dar Oakley in the Ruin of Ymr Dar Oakley, the main character and storyteller in my new novel, is a Crow. (In the book his species gets a capital letter, as do all the other species of animal and plant.) The Crow Dar Oakley – the first Crow in all history to have a name of his own among his own kind – was born somewhere in westernmost Europe centuries before Caesar came to conquer Gaul. 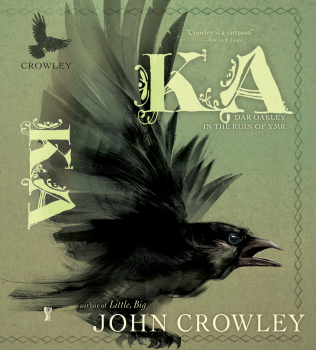 I’ve been asked why I chose a Crow to write about. Well, there’s my name first of all; the origin of the English name is “field of crows”. 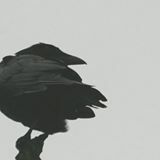 I have always been intrigued by Crows: their raucous and disputacious communal life, their sleek blackness, their proven intelligence, the mythologies and fables about them (as omens, as too smart for their own good, as faithful compatriots and spouses). All of those aspects are in the book, and more too. The conception was a book of stories—a picaresque, one adventure after another as Dar Oakley learns to speak with a human and is led into one mythos after another in era after era: going into underworlds or realms of story to retrieve something, or gain something, or simply by mistake. By the end of the story he is alive in the northeast United States at a time in the near future. How Dar Oakley got a name, how in various ages he came to learn to talk with certain People, and how he gained an ambiguous immortality – that’s the story he tells.